Anchor: South Korea’s Joint Chiefs of Staff(JCS) says that a magnitude five-point-seven earthquake has been detected in northern North Korea on Sunday. 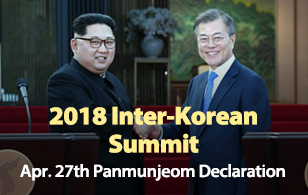 North Korea said that it conducted its sixth nuclear test and succeeded in developing a hydrogen bomb that can be mounted into its intercontinental ballistic missiles. Kim Bum-soo has the details. 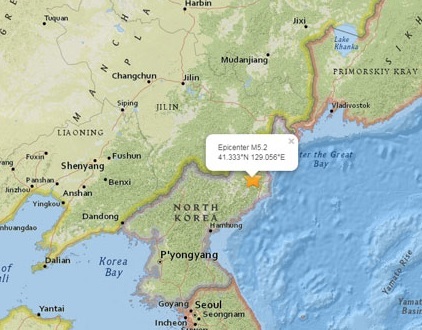 Report: The tremor was first detected at around 12:29 p.m. Sunday from a location near North Korea's nuclear test site. While revealing its detection of the five-point-seven magnitude quake, the South Korean Joint Chiefs of Staff said that the tremor is due to a sixth nuclear test conducted by North Korea. About three hours after the detonation, North Korean state media made an announcement, saying that the regime successfully carried out a test of its hydrogen bomb that can be put into its intercontinental ballistic missiles. Authorities had been monitoring the North’s Punggye-ri nuclear site in North Hamgyeong Province amid predictions that the Pyongyang regime could carry out another nuclear test on or around the anniversary of the country's founding on September ninth. North Korea conducted its fifth nuclear test on September ninth in 2016, creating a tremor of around five on the Richter scale. A South Korean official has reportedly said that a five-point-seven magnitude tremor would translate to an explosive yield of about 50 kilotons. Other experts also estimated that the tremor was at least five times greater than the previous underground nuclear explosion last year. An official at the Korea Meteorological Administration said if the latest tremor was due to a nuclear detonation, the explosive yield of it would be about 12 times greater than the fourth test which was also conducted last year. Authorities, however, have released different measurements for the size of the tremor. The U.S. Geological Survey(USGS) reported the five-point-six quake in the North with the depth of the epicenter at about ten kilometers but later updated the magnitude to six-point-three. China's earthquake authority also said the tremor measured at a six-point-three magnitude, and was followed by a four-point-six magnitude quake about eight minutes later. Shortly before what appears to be a nuclear detonation, the North’s official Korean Central News Agency(KCNA) reported that Kim Jong-un inspected the loading of a “homemade” H-bomb into an ICBM during his visit to the Nuclear Weapons Institute. The state media said that scientists further upgraded its technical performance at a higher ultra-modern level on the basis of precious successes made in the first H-bomb test.